Every minute thousands of pieces of content are produced. Big brands, small companies, people that don’t even know what to achieve with their content marketing efforts are all producing content like never before in the history of humanity. People are getting more and more content savvy and can tell the difference between good content and bad content. The winners are companies that know how to stand out with their good content. In this article, you’ll read about 4 content marketing strategies that will set you apart from your competitors. For you as an e-commerce business owner, a good content marketing strategy could take different meanings depending on your goals. To increase awareness, you can rely on keyword-optimized blog posts, a video ad series, user-generated content on social media, or any kind of content suitable to your customer acquisition channels. To increase sales and customer retention, you can have your own newsletter or even a magazine addressing the core issues your customers are facing. The key to an effective content marketing strategy is to know your customers well and have a clear customer journey map. If you’re offering skincare products, you don’t necessarily need to offer coupons or discounts to increase sales. A comprehensive guide on having the perfect skin (your customers’ ideal state) would do the trick. Convince people that being in your list gets them one step closer to having great skin. People are frequently exposed to bad content. In fact, they see so much bad content that they can immediately detect good content. Here’s how: people consume so much bad content that does not address the core issues as it should. They are left high and dry in their quest to find answers for their issues and get frustrated. Once you address those issues accordingly, they’re going to worship you. What seems to be a frustrating foray for many business owners and content marketers (standing out) will in fact be an advantage. So you don’t need to be set back because of content overload if you know how to produce content that addresses core issues. But first, before you get down to work and produce another piece of content, you need to keep the following tips in mind. Any genius technique could be ineffective once it’s crudely overused by imitators. Blogging used to be much easier and more fun some years ago. You published a short piece, distributed the link in social media and some blogging entries, and you would have good traffic just from that. But today, with the huge number of enthusiastic bloggers, getting the same results is much more difficult. These days, everybody is blogging — it’s rather a cliché now. Like any other investment in your life, you shouldn’t focus all your might on one content format. Video, for instance, is not well explored by companies. Over the past years people have grown more interested in video content, so much that in 2016 one Facebook executive predicted that the platform will be probably all video in five years. Results of a survey show that people pay full attention to video content and want to see more videos in the future. Plus, YouTube as the second biggest search engine deserves special attention from businesses. Podcasts are also an effective means of building an engaged audience that will restlessly wait for your next episodes if you’re interesting enough. Podcast subscriptions on iTunes alone reached 1 billion in 2014, and the number keeps rising. A good example of the use of podcasts in e-commerce is well shown by The Spoon. They have two amazing podcasts to educate and engage their audience with: Smart Kitchen Show and the Weekly Spoon. Here’s an interesting episode from their Smart Kitchen Show. When you consider the fact that mobile internet users make up 51.2% of all internet users worldwide (that is 3.7 billion unique users), it is crucial to try and make content that is easily consumed on mobile. Social messaging is one of these content types. 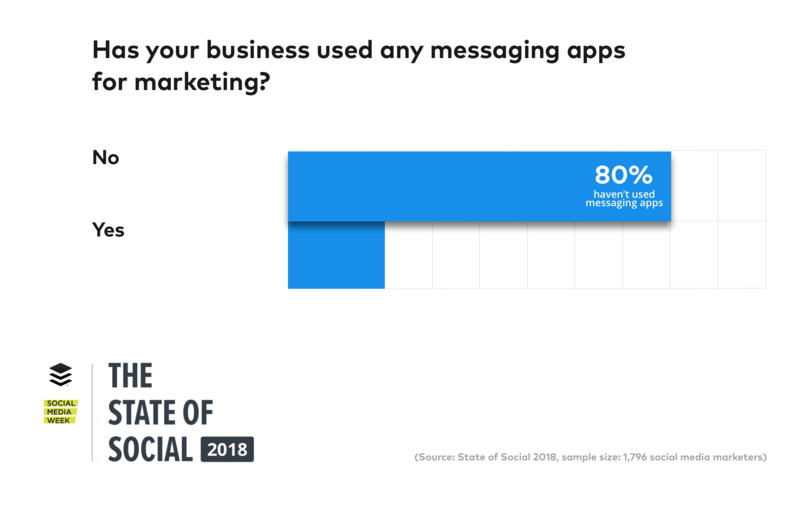 Buffer’s State of Social Report 2018 shows that there are now more people using the top four social messaging apps (WhatsApp, Messenger, WeChat, and Viber) than the top four social media apps (Facebook, Instagram, Twitter, and LinkedIn). Yet only 20% of marketers have used social messaging for marketing. Videos, podcasts, and social messaging seem to be great choices for diversifying your content formats. 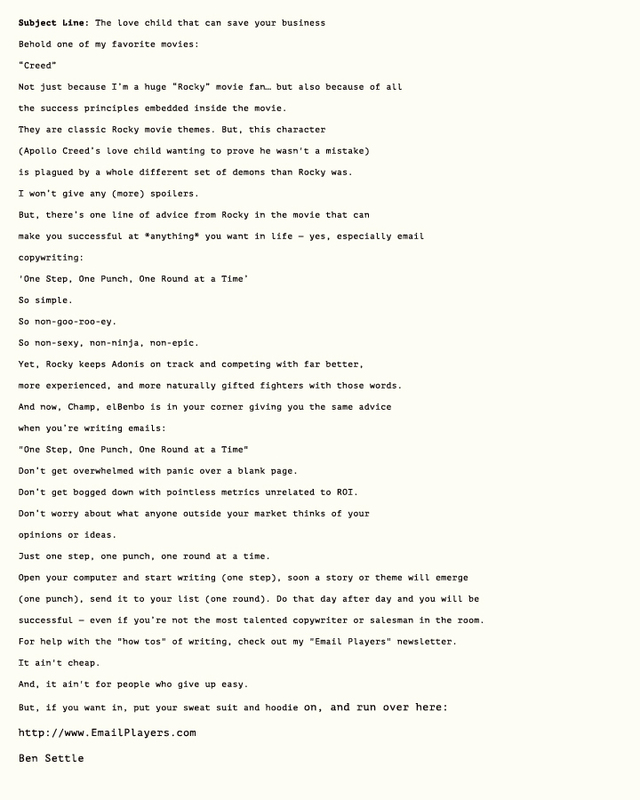 When one of his followers asked Ben Settle, the great email copywriter, how to have a voice in writing in a Q&A session, he answered that you should write the way you speak, with all the tonal nuances, expressions, pauses, etc. When people read your stuff, it should be like they hear your voice in their heads too. Yet this is what most people neglect and as a result their content turns bland and uninteresting. I’m not saying that you should always sound the same, use the same adjectives, and have a static writing style anywhere (after all, each platform and publication has some instructions) — people would find that boring — but depending on your audience and platform, you can try to sound excited, lively, bored, etc., just like when you talk. people. So if your audience is into a sassy style of writing, you need to adopt it. Speak/write in a language that’s interesting for your audience. The same is true about the kind of content you produce. As Jimmy Dally explains, actionable (how-to) content could be a great choice, but in many cases, publishing only tactical how-to guides will result in missing strategic-minded people (decision-makers). What you need to do is produce strategic content (models, frameworks, principles, opinions) that appeal to your strategic readers so that you can attract them too. A CEO, for example, is more interested in an article on why having a customer journey plan is the answer to almost all their company’s problems, rather than a step-by-step guide on developing a customer persona. BuzzSumo analyzed 1 million blog posts on the web and found out that 75% of them had no external backlinks, and 50% of them had two or fewer Facebook interactions (likes, comments, shares). 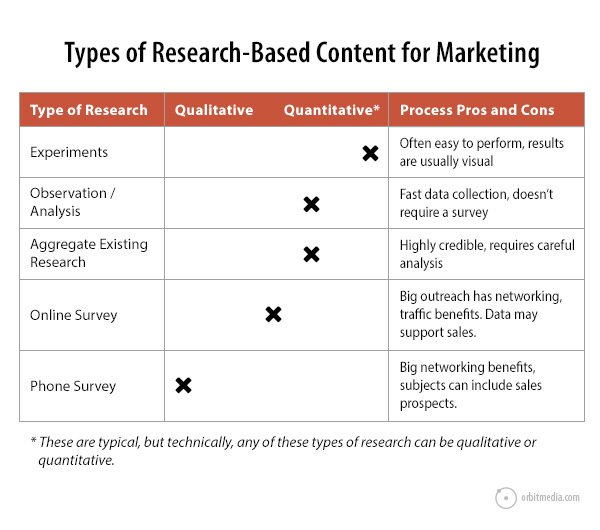 Yet one type of content that got a lot of links and shares was well-researched and evidence-based blog posts. Everybody knows the value of original research. Google’s Matt Cutts has always preached the importance of original research for link building and SEO in general. Any link to your research content will have a positive effect on your overall domain authority. But apart from SEO benefits, original research establishes you as an authority on the topic and cuts through the rehashed content that is being produced restlessly by imitators. One of the easiest ways to produce original research is gathering the existing data from different sources. Maybe there is already a body of work that you can use and produce new data from and then do original research. How many of the top websites have calls to action (CTAs) above the fold? 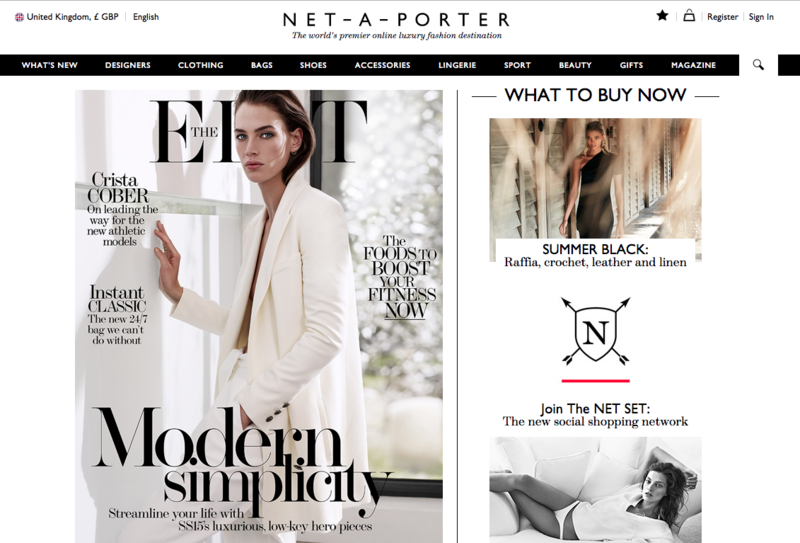 What CTA types are used above the fold? 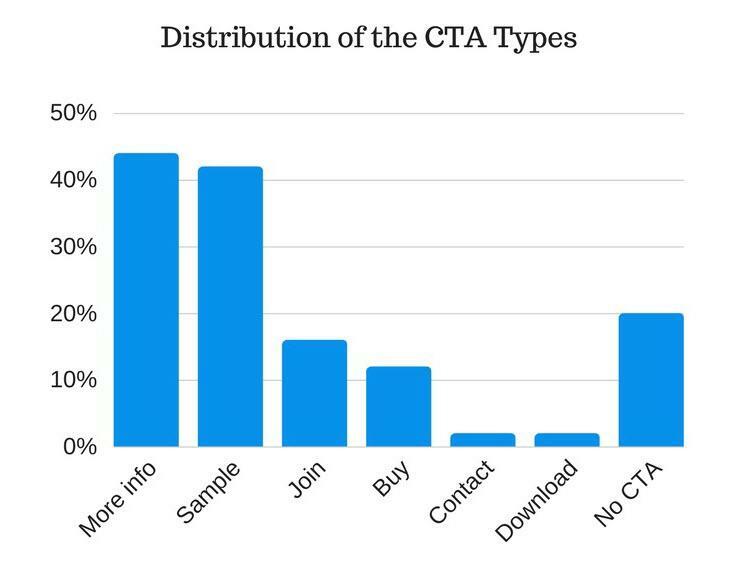 How many of the top websites have multiple CTAs? Do the websites use any social proof (trust icons, testimonials, case studies, etc.) on their homepages? What social proof types are most prevalent among top websites? Do they use any videos on their homepages? Do they offer any content in exchange for visitors’ email addresses? A little creative vigor goes a long way in your content. Just like content type, tone, and language, people are used to reading the same content topics everywhere. But if you can incorporate interesting topics and news in your content, people will be more excited to read. The idea of entertaining people while giving them information and advertising to them is called infotainment in copywriting. One of the staunch advocates of such a content type is Ben Settle. As he explains in a blog post for Copyblogger, infotainment gives your audience a great-tasting hot dog but nourishes them like broccoli. In other words, your content can be both entertaining and informative (about your product). So instead of listing the features of your product in a sales letter to your email list, why not give them something exciting and connect it with your product? Ben frequently refers to pop culture (which is exciting) and is a master of connecting his stories with the information about his products. Needless to say, if you don’t know what topics are interesting for your audience, consider doing market research or hiring a consultant to do it for you. Trust may be the single most important word in business. I’m not talking about blind trust. Healthy skepticism is one of the most important tools in the entrepreneur’s tool kit. I’m talking about being trustworthy. Literally: worthy of trust. And no, I don’t mean a new sales technique or copywriting tactic. I mean being worthy of trust. And as Consulting.com explains in a post on becoming an independent consultant, one of the most effective ways to gain people’s trust is helping them transform to their desired states, and the more valuable that desired state is to someone, the more they’ll be willing to pay for help getting there. So do everything you can to help your readers get one step closer to their desired states, whether it’s a more profitable business, a healthier body, a more organized house, more confident social interactions, etc.